Liberty Chronicle Independent was on the scene outside of local news station K5 in Seattle covering the "Open the Presidential Debates to Dr. Jill Stein and Gary Johnson" protest. 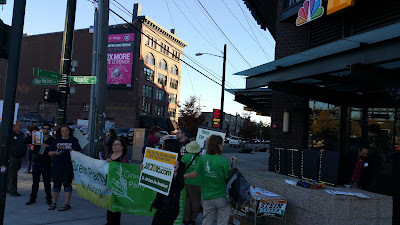 There was a unification in stance against the debate commission as also seen in Washington D.C.; Both the Libertarian Party and Green Parties of King County (Seattle) joined forces to raise awareness of Presidential candidates Gary Johnson and Jill Stein, and their exclusion to the first National Debate between Hillary Clinton and Donald Trump. Both Gary and Jill are polling high, yet have been excluded from the first debate. 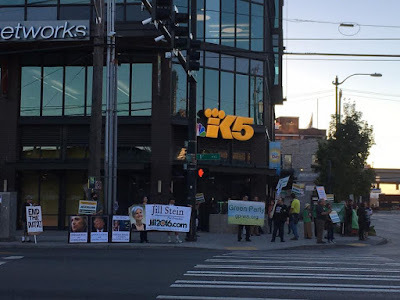 Johnson supporters at the protest made the claim that being on the ballot in all 50 states and D.C. should be an automatic inclusion to the debates. One thing is certain, there is a sense of unity among independents. "The Green Party and Libertarian Party are essentially the same on social equality, we only differ on the economic side. As far as I'm concerned, we're in this fight together until we are both given equal access to debates and ballot access. We can sort out the minor differences in details later," one Libertarian said. 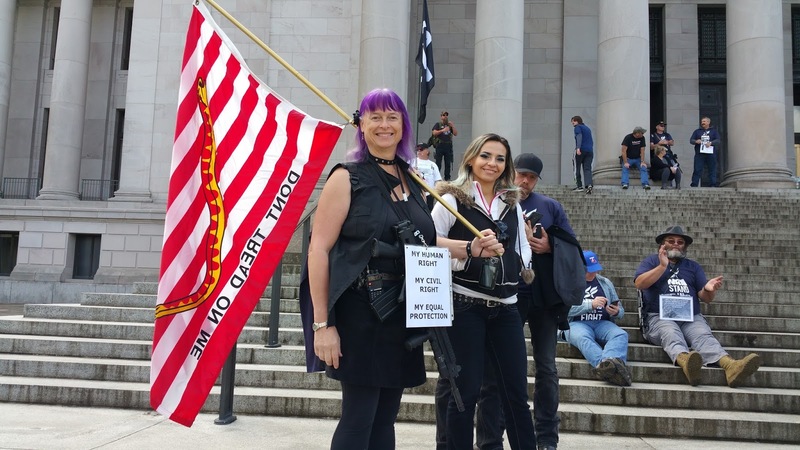 We at the Gun Rights Coalition, the Oregon Council on Firearm Rights, and many other groups in the Pacific Northwest that will support and attend believe in the Original Intent of the Constitution. That our inherently protected right to keep and bear arms IS ABSOLUTE and that no level of government has the authority to restrict that right in any capacity, in any form or in any fashion no matter the class of firearm or the accessory in which is attached to the firearm including ammunition feeding devices. September 23rd. we will rally in Salem, Oregon and on September 24th. 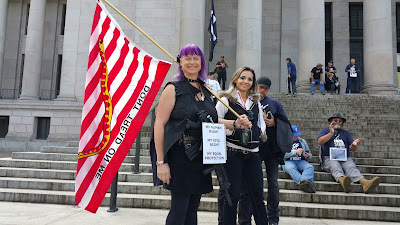 we will rally in Olympia, Washington to say NO to unconstitutional laws that infringe and impair on our inherent right to keep and bear arms not only for self defense but also to defend against tyrannical governments, both foreign and domestic. Let's be clear, our rights are not negotiable and we demand that government keep their "laws off our rights". 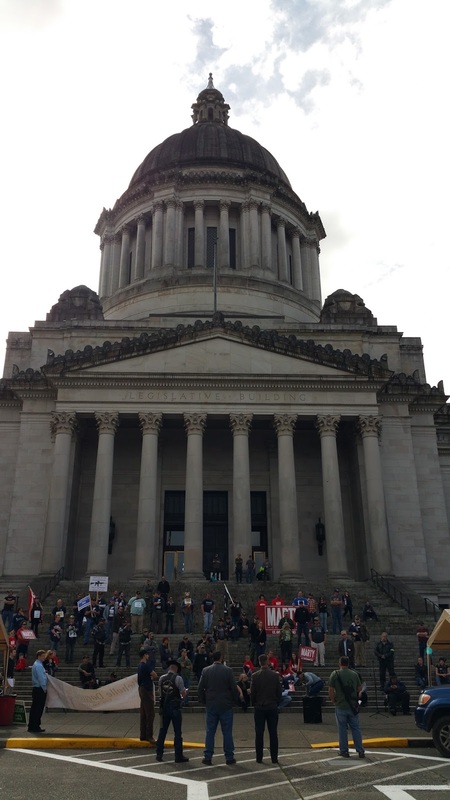 In Washington we will rally at 11 AM on September 24 on the front steps of the State Capital in Olympia where we will make a statement that we will not sit idle. Following this we will have an Open Carry Family Picnic in the area of Tivoli Fountain so plan to bring your lunches with you. Details for the Oregon Rally can be found at this link. Please attend both if at all possible as these rights do not stop at borders. Therefore we must fight them without regard to borders as well. 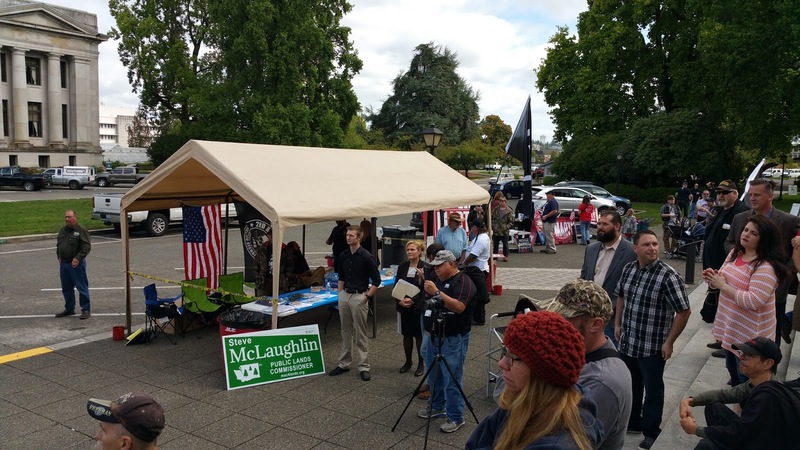 There was a turnout of about 150 or so, many representing Gary Johnson, Presidential candidate from the Libertarian Party and WA state candidates for Public Lands Commissioner Steve McLaughlin and Lt. 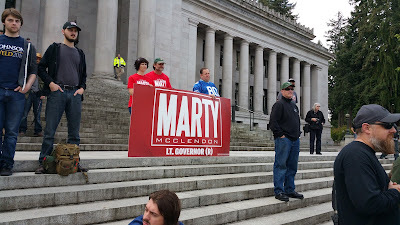 Governor Marty McClendon teams from the WA state Republican Party. Libertarians who are known to support all Amendments, set up shop near the rally steps. MUSKEGON, MI -- Libertarian Michigan State House Candidate Logan Fleckenstein has signed the “Stop Fed Ed” pledge circulated by Michigan Parents Involved in Education (MIPIE), a group demanding an end to the U.S. Department of Education, and Stop Common Core in Michigan, Inc.
Republican, Democratic, and Libertarian candidates at every level of government across the country are being asked to sign a pledge to end the US Department of Education. 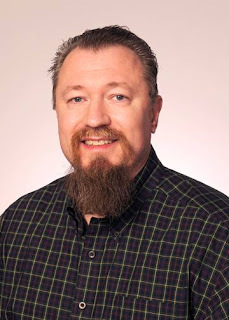 The interviewee Mike Kolls, running for US Congress - District 24 in Texas as Libertarian. You can find more information on Mike on Facebook facebook.com/tellwashington/. Interviewer is Contributor for the Liberty Chronicle Independent; Alex "Love" Jones. AJ: I understand you are running for Us Congress out of Texas. Which District and what made you decide to run for the people of your district? Explain to the viewers what brought you into the political world? MK: I would like to represent The People of US congressional district 24. This is NE Tarrant Co., NW Dallas Co., and a small portion of South Denton Co.
Our federal gov’t is out of control. It tries to do too much. And what it does, it does poorly. We The People should have more control over our day-to-day lives. It’s really about bringing decisions back to kitchen tables and communities. We really don’t need any help, really! Give us Liberty, we can handle the rest. I’m also struck by Albert Einstein’s observation, “We cannot use the same thinking to solve problems that we used when we created them”. AJ: What is your definition of Liberty? What is your interpretation of the founding documents that birthed the US? MK: Liberty - The ability to act without external controls (like government). It also infers authority to act against arbitrary or oppressive controls. It is similar to and related to Freedom and Sovereignty. The Declaration of Independence explains what the Founding Fathers had in mind. The first third shares the future vision of free men (and women). The last two-thirds cites specific abuses committed by gov’t upon The People. More citizens should regularly read and re-read The Declaration of Independence. The high-point of Freedom is expressed in the US Bill of Rights. The natural rights expressed are inherently ours; they are NOT a grant of “gift” from gov’t. I wonder if we can work back towards The Articles of Confederation. The balance of authority between the Sovereign States and the (less powerful) federal union has been lost. This idea is expressed thoroughly in Federalists #42 through #47. AJ: As one of your key issues which is defending personal Liberty. How would you use your experience to solve these issues of what's going on in Congress right now? MK: “Follow the money.” How the federal gov’t spends OUR tax dollars tells the tale. It’s ironic… they use our money to limit our Liberty. Gov’t grows on the efforts of producers and individually-created wealth. AJ: You say the scope of government needs to be reduced. What programs or funding would you cut right off the bat? Where should we be at in 1 year or 4 years from now if you are elected? MK: Gov’t does a poor job of “picking winners and losers”. To trim gov’t based on whim will trigger more ardent political battles and division. We need to reduce spending across-the-board at the same rate – a 4% annual reduction. This way the pain is evenly spread… and political battles become less fervently fought. Comedian Groucho Marx quipped, “Politics is the art of looking for trouble, finding it everywhere, diagnosing it incorrectly, and applying the wrong remedies.” I certainly agree. AJ: What would we Mike Kolls tax policy? What current Federal level taxes would you work on? MK: Our national scandal is NOT a poor tax policy, it is massive debt - $ 19,500,000,000,000. I recommend NO CHANGES to the US Tax Code until the federal debt is paid-in-full. We need federal receipts to pay the massive debt. We can take tax reform action near the year 2056. Forty years from now, with forty years of annual spending cuts, we should be able to cut individual income taxes to 50% of 2015 rates and eliminate corporate income taxes. The details of my plan are at http://tellwashington.us/dDebt.html #plan. AJ: When talking about the border and border issues since you live in a state that is connected with Mexico what is your stance on immigration? How would you address this to your constituents if elected? MK: People that contribute to each Sovereign State and the nation at large should be able to stay and be part of us. I favor open borders, but NO federal benefits to non-citizens. Taking away an unearned incentive may dissuade some taking advantage of US generosity. All immigrants must pay applicable taxes – federal, state, and local income taxes. Immigrants reside in a Sovereign State. They must first become citizens of the state in which they reside. Each Sovereign State should be able to a) welcome or discourage immigrants and b) to set the criteria for state citizenship. A citizen of a state may then apply for US citizenship. As a federal Representative I do NOT want to issue edicts to the Sovereign States. I offer the following suggestion to the states – each immigrant and/or his sponsor must fund the immigrant; there will be NO federal assistance. A sponsor must be a) a US citizen, b) a US corporation or business, or c) a US charitable organization. AJ: Before we go, what kind of outreach are you doing for your campaign? Are you traveling around the state talking to people or is this a social media based campaign? What is the best way for people to reach you with any questions? MK: Ideas should dominate political campaigns, NOT money. I have raised $0. That total will NOT change through Election Day. The ideas of Libertarianism are orthodox Americana – individual Freedom and minimal gov’t. We the People are the reason government is established. Gov’t must zealously defend OUR Life, Liberty, and Property. Third Party success will depend upon media coverage and access. With access, our Liberty-leaning vision/ideas can be heard (… we might have part of the solution). I am hoping for 5, 10, or 20 minutes of fame… to share a vision of a gov’t “…of the People, by the People, for the People”. Please visit my campaign website – http://tellwashington.us (or http://tx24.us) to see and evaluate ideas on how to maximize individual Liberty. Also, start a dialogue with me; my campaign email is at the top of each webpage. AJ: Thank you Mike for sharing with Liberty Chronicle. If you live in his district please take a look into him at his page and go out to vote. There is much we carry in our hearts, minds and spirits as we run this race before us. We are running a race of significance. Of endurance. We feel the sweat, the breath in our lungs and the burn in our legs. The Mountain top is worth the effort. This is where we turn to one another, trust in our leadership, our relationships and take the next steps together. To do in fellowship what we have all been entrusted to do individually. The pace can be frenetic, the cost high and the soul tried. The spirit is simultaneously wearied and buoyed. Wearied by the size of the task, the attacks and yet buoyed by the goodness of our purpose. 1) We have been sent to accomplish work. 2) The timing is now. 3) We have fields ripe for harvest. 4) The harvest is a result of many laborers. 5) Though it is labor it is a shared, joyful work and we are where we are today because of what others have done before us. To be sure there is a spiritual nature to what Jesus was revealing but whether or not you embrace Christ as I have or do not - when we work together with these 5 Points in mind we work in a way that unifies, lifts up and sustains us individually and corporately. We are not alone in our efforts. This is fitting as we are no longer looked upon as a curiosity or an afterthought. Johnson-Weld is a genuine threat to the powers that be and the fight is on. The obstruction we have faced before in our efforts is now melded with outright attacks and distortions. Do not take these personally. Do not give these things room to beat you down or distract you. They do not matter. We have something of real substance. Do not focus on the right or left but keep squarely in step with each other. Trust that what you need will be there when you need it. Trust also the two at the top of this ticket. We have a long distance endurance athlete and a grand master chess player working with a strategy in play by veteran strategist. We have proven leadership. Let us each support, encourage and bolster the steps of our Leadership and of our Brethren. We have a ticket worthy of respect. We have an endurance and a sustenance that comes from doing together what is good. So together let us fight this good fight, Let us run this race. I am thankful and grateful for each of you in this endeavor we are in. We will not go gently into that good night. 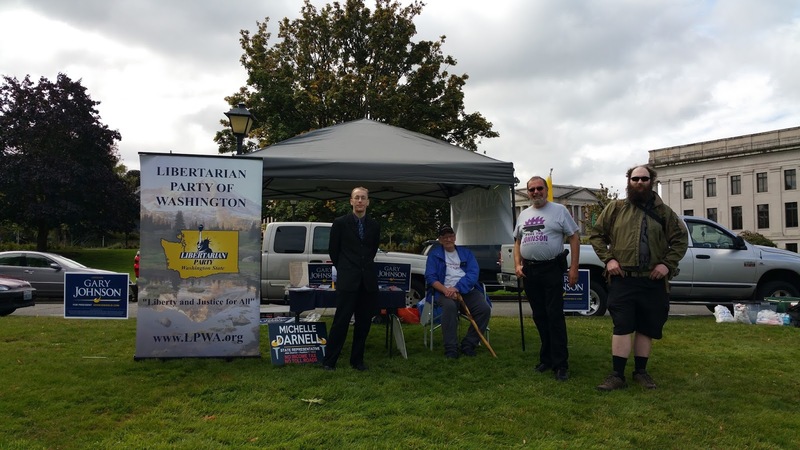 Liberty Chronicle Independent Exclusive: 60 Minutes with Michelle Darnell 2016 -L of the 48th District, House of Representatives candidate in Washington State. 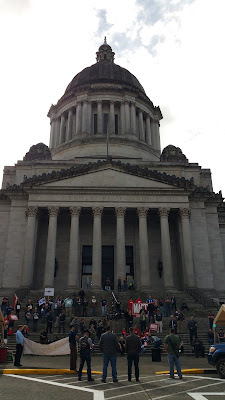 Michelle is going to walk over 70 miles to Olympia to raise awareness on Foreclosure/Fraud and Homelessness. 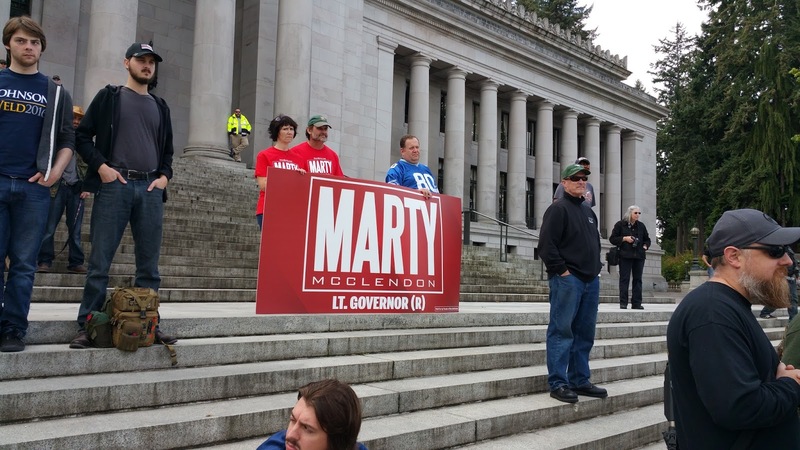 Her efforts have recently gained her the endorsement of Bill Bryant for Governor, Steve McLaughlin- For WA State Public Lands Commissioner and Marty McClendon for Lt. Governor, all from WA respectively. Education, Transportation, Delivery of Mental Health services, Criminal Justice reform, Homelessness and the recent push for a WA income tax and more are covered in this information packed interview. 2016 Libertarian Presidential candidate, Gary Johnson interviewed by Independent Associate Editor of LCI, David Malekar. Packed to the brim. That's the best way to describe the attendance of the event. A very diverse crowd of millennials, baby-boomers, all ethnic backgrounds, genders, and ages. People were electric to see Gary Johnson in Seattle. Libertarian Party Chariman, Nicholas J. Sarwark started the event, followed up by former Nirvana bassist Krist Novoselic (9:13 mark in video). Drew Carey (12:29 mark in the video) spoke on behalf of Governor Johnson as well. At the 18:18 mark (in the video) Bill Weld's wife, Leslie Weld spoke on behalf of the two candidates. Bill Weld made his appearance at 28:05 mark (in the video) with a "12 Man" jersey for the Seattle Seahawks, talking about his appreciation for Russell Wilson (Quarterback for the Seahawks) and Pete Carroll (Head Coach of the Seahawks). Telling the audience that "they are their 12th Man." Weld reinforced the points about limited government and personal freedom only being achieved with a Johnson/Weld ticket. There was a few choice words for Donald Trump as he poked fun at about the 43:18 mark (in the video) about being "as bald as an egg." Weld also made the statements about how the Republicans and Democrats are only out to "kill each other." Gary Johnson to the roar of the audience, made his mark at 51:17 (in the video). Gary showed a very strong appearance by standing strongly against our intervention overseas in "regime change." Gary made a very interesting statement about Bill Weld supposedly being in line to be the Ambassador to Mexico in 1997 during Clinton's administration; but was blocked due to being "pro-choice, pro-gay rights, and pro medical marijuana." Johnson went on to talk about the importance of the free market and small business, wanting to make it easier for small business to survive and thrive. He spoke more on the crisis of Social Security, Medicare and Medicaid and how everything is open for discussion on making things better. In this exclusive interview with LCI, Gary speaks on the importance of Criminal Justice reform and how he plans on fixing the issues at hand, and accountability, from the Top-down perspective as Commander in Chief. Criminal Justice reform is a major concern for millennials as injustices have been brought to light in recent years by decentralized organizations such as Cop Block. As we draw closer to the end of the election campaign, the Johnson/Weld campaign is going full force. They did mention another possible visit to Seattle before the end of the election, as Washington is considered a targeted state. Be sure to continue to follow the Liberty Chronicle Independent online at http://www.libertychronicle.net and for more updates at http://www.facebook.com/libertychronicle. “It has come to our attention that Fox News is running misleading ads for the first presidential debate scheduled for September 26, which show just two participants: Democrat Hillary Clinton and Republican Donald Trump. The Commission on Presidential Debates has not yet announced whether it will include Libertarian Gov. Gary Johnson in debates. “The CPD has said that to qualify, candidates must poll at 15% in five polls selected by the commission, but has indicated they may include Gov. Johnson if he comes close. Johnson has hovered around 10% in polls. "Governors Johnson and Weld are polling higher than any Libertarian Party presidential ticket in history, more than covering the spread between the old party candidates and they have racked up endorsements from scores of prominent politicians and luminaries in various fields. Editorial boards of major newspapers like the Chicago Tribune and Richmond Times-Dispatch have publicly called for Johnson to be included in the debates. The Times-Dispatch, Tim Kaine's hometown newspaper, gave their official endorsement to Johnson. This is remarkable, especially considering the light media coverage Johnson has received compared with the saturation coverage that the media has showered on the Republican and Democrat. “An August Quinnipiac University poll shows 62 percent of likely voters nationally say Gov. Johnson should be included in the debates this year. Pretending Gary Johnson is excluded when no decision has been made misleads viewers and does a grave disservice to voters who are hungry for an alternative. "The Libertarian Party requests that Fox News immediately pull all misleading ads, and refrain from making any public statements, which give the impression that only two candidates will be in the debates. 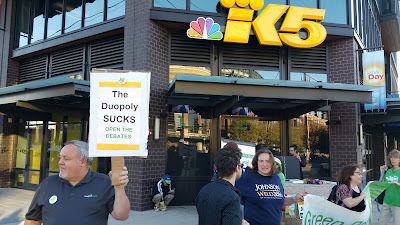 We hope for similarly fair and truthful representations of the debates from all media outlets covering the election and urge them to step up their coverage of our two very qualified candidates so every voter can make an informed choice." The Libertarian Party is on track to be on the ballot in all fifty states and DC.